Greetings to you all! It is once more my pleasure to share AEA-Europe’s news in the Autumn 2017 edition of our newsletter. In this issue, our AEA-Europe President, Dr. Thierry Rocher goes down memory lane to provide us with an overview of the developments that the association has accomplished during this past year. It is a reminder of the significant headway we have made since the last conference in 2016, thanks to the contribution and commitment of all our members. Then it is conference time again! AEA-Europe looks forward to welcoming you to this long-awaited moment in Prague this week. The team from Scio, hosting the event, has worked extremely hard to make us feel at home in this beautiful city, where the AEA-Europe’s inaugural conference was held in 2000. Don’t forget to use the new Mobile App to schedule your own conference agenda. Beyond the rich conference programme, SCIO gives us tips on where to go and what to visit in Prague, make sure you make the most of the conference and your stay there. Have you had the opportunity to check out our new website? Completely restyled, it went online a few days ago, just in time for the conference. Take your time to browse through it on your computer or mobile device and let us know what you think of its new look, contents and features. Next, we congratulate Dr. Fazilat Siddiq who won the 2017 Kathleen Tattersall New Assessment Researcher Award for her research work on assessment of ICT Literacy. Join us this week during her keynote presentation at the conference to learn more about the status, innovations and future directions in the field of ICT Literacy Assessment. AEA-Europe is ever so proud to launch its very first AEA-Europe Special Interest Group (SIG) on E-assessment. Take this opportunity to meet its pan-European steering group from research, industry and academia in its first discussion session on Friday morning during the conference. More information on international large-scale assessments is also available on IEA’s centralised website “Gateway”. Discover thematic pages and rich sources on these large-scale education studies in various forms such as fact sheets, frameworks, designs, results, data and papers, all addressed primarily to researchers, policymakers and decision makers. As e-assessments pave its way in the world of education, the International Association for Educational Assessment is another authority that also offers researchers and practitioners to share their understanding at its 44th Conference in September 2018 at the Oxford University Centre for Educational Assessment. On a final note, I am delighted to mention that this newsletter is the association’s 4th edition for this year, compared to only two produced in the previous years. I therefore wish to thank our contributing authors for using this space to share their latest news on educational assessment. Calling on all readers, please consider sharing your work too. Contents may range from relevant research areas in educational assessment that you are investigating, policy programs being piloted or implemented to improve system and/or classroom assessment, education technology tools that you are using to add a new dimension to student assessment, or collaborative initiatives between researchers and practitioners to impact teaching and learning. You could even describe your presentation to the conference in a short text and make it available here so as to reach a wider audience. Should you wish to share your story in the next issue of our newsletter, please feel free to reach out to me during the conference in Prague or drop me a line at aminath.afif@men.lu. It is only a year ago after the Limassol conference that I stepped into my new role as President of AEA-Europe and here we are again ready to start off our 18th conference. This time AEA-Europe returns to the beautiful city of Prague, which in 2000 hosted the association’s inaugural conference. Since months, the local team Scio have been putting all their energy and enthusiasm to make sure the conference runs like clockwork and we look forward to welcoming you all next week. Download our brand new Mobile App and you will be able to set up your own conference agenda, access the programme, set reminders for the presentations you wish to attend, link up with other attendees and vote for your favourite poster. Meanwhile throughout the year, besides organising the conference, the association has been working hard to introduce new ideas, put in place new communication tools and refine its procedures and rules – all in response to the feedback we obtained from our members. On the social media front, our Facebook page was launched in January and ever since, the association has significantly increased its postings on Facebook, Twitter and LinkedIn. I am also delighted to inform you that our new website finally went online a few days ago and as you requested, it has been given a fresher and more appealing look and is more user-friendly. We have also increased our newsletter frequency from two to four this year. Please do consider using this space to share your news about your work in the field of assessment. The association’s activities moreover included reflections on the revision of the AEA-Europe standards as well as the launch of our first Special Interest Group (SIG) on e-assessment, both which will be the subject of a discussion group during the Prague conference. Professional development was yet another aspect which was strengthened this year through the accreditation process and the promotion of the network of PhD students. These two networks will also meet in a special event during the course of next week. During the next coming months, the association will continue to grow and promote the new tools and ideas that are now in place. Our next goal is to establish a strategy in order to increase its membership and its diversity so that even more European countries are represented in AEA-Europe. Time has simply flown by since last November and the year has been rich and exciting. As I look back on all our achievements this year, I feel blessed and grateful to be surrounded by the dedicated and hardworking members of the council and the various committees, who voluntarily take the time out of their busy schedules to support the work of AEA-Europe and help us achieve the goals of the association. My big heartfelt thanks go out to you all, as well as to all our members near or far, whose participation allows AEA-Europe to spread its network in Europe and beyond. Looking forward to meeting you all soon in Prague and enjoy the conference! It all started in the year 2000 when we all gathered here in the heart of Europe to discuss the theme “Improving Assessment in Europe”. Now after 17 years, AEA-Europe together with Scio come back to this beautiful city to reflect on its 18th annual conference “Assessment Cultures in a Globalised World”. The conference will take place in the Corinthia Hotel on 9-11th November 2017 while pre-conference workshops will be held on November 8th. You can look forward to exciting discussions about assessment cultures, its nature and different strategies and ways that you can later put into practice. The pre-conference workshops will be an opportunity to learn how to design computer-based assessment or conduct equating in practice, to gain insight in comparative judgment for research, about item banking or you can discuss the problems and potentials of large-scale assessments. In today’s multicultural world we are often faced with dilemmas of how can we please everyone – is there a thing like a size that fits all? Assessment is a complex and multifaceted practice and people from different cultures bring various experiences and understanding of assessment cultures. Can we develop assessment and assessment systems that are culturally sensitive that allow every student to show us what they can do? Beyond the rich conference programme, the hotel venue itself offers a beautiful view rising above Prague nicknamed „the City of a Hundred Spires“. Prague proudly maintains its historical centre where all tourists visiting this astonishing city fall in love with the somewhat poetic spirit that will make you want to stay. Prague and its Bohemian atmosphere will ease your mind on many late rainy strolls through narrow streets of Old Town during November evenings. For those who fancy sightseeing, visiting the Charles Bridge, Prague castle or Old Town Square and the Astronomical Clock, is a must. Prague also offers many fascinating museums exhibiting art from all eras in Veletržní palác or contemporary art in DOX. For cosier and more intimate spaces, visit one of many small galleries hidden in the city centre, like museum Montanelli located a mere 2 minutes from Malostranska square. For an extraordinary culinary experience, meat lovers should try “Naše Maso” or “Čestr” – one of Prague’s best – whereas for pasta and italian food, “Wine Food” offers a rich variety of pizza and pasta dishes. Networking at conferences has led to many long-term collaborations and we hope that this year we will meet some old friends and colleagues and make new ones. We are looking forward to seeing you here in Prague. For this year’s annual conference in Prague, the association created a Mobile App which will let you, among many other things, set up your own conference agenda, access the programme, set reminders for the presentations you wish to attend, link up with other attendees and vote for your favourite poster. The app is available on iOS, Android, Amazon, and BlackBerry 10 devices. Open the app and scan the QR code below or search “AEA-Europe 2017”. During the General Assembly meeting in Limassol last year, proposals were made by members to upgrade the association’s website and work started to this effect at the beginning of 2017. It is our great pleasure to announce that the new website https://www.aea-europe.net/ went online last week. Sporting a fresher look, it is also more user-friendly (especially on mobile devices) and navigation is much easier. 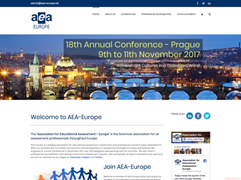 The AEA-Europe website is the association’s main portal for conveying information to our members and to the wider assessment community. Here you can access information about the previous conferences (the location s and conference themes) dating back to the association’s first conference in 2000. A selection of presentations and posters presented at these conferences are also available to view or download. In addition to information about the annual conferences, members will have access to information on the activities of the association’s council, members, committees, and associates. The AEA-Europe newsletters since 2008 are also online. Non-member users can sign up to the website to receive the AEA-Europe newsletter and apply to become members of the association. Documents can be submitted for accreditation and registration for the annual conference can also be done through the site. A small note to current members: for technical reasons, you will receive an automated email kindly asking you to change your existing user-account password as soon as possible to log in to the members area. We hope you enjoy browsing around our new website and we would love to hear your feedback or comment – please do not hesitate to email us at admin@aea-europe.net. AEA-Europe is pleased to announce that Dr. Fazilat Siddiq is the recipient of the 2017 Kathleen Tattersall New Assessment Researcher Award. Dr Siddiq currently works as a researcher at the Nordic Institute for Studies in Innovation, Research and Education (NIFU). The jury evaluated the award based on the content extracted from her PhD-dissertation entitled “Assessment of ICT Literacy”, delivered and successfully defended at the Department of Teacher Education and School Research, University of Oslo. As the winner of the award, Dr. Siddiq will deliver a keynote presentation during the annual conference in Prague, entitled: “ICT Literacy Assessment: Status, Innovations and Future Directions”. This will include an updated review of the rapidly evolving construct(s) of ICT literacy and the equally rapidly changing field of research. Her work builds and is referenced on various collaborations with researchers not only from a European/American perspective but that across the world. In addition, Dr. Siddiq’s research has a high potential of impact since the results can feed into policy-making and be used in practice, given that the research touches upon working with ICT literacy assessment at a fundamental, general and overarching level. The research demonstrates the skillful application of a variety of designs and methods, such as the first systematic review of assessment instruments worldwide analyzing the properties of measures of ICT literacy. For further information about Dr. Siddiq’s research, please contact fazilat.siddiq@nifu.no at The Nordic Institute for Studies in Innovation, Research and Education, Oslo. Special Interest Group (SIG) on E-assessment – meet us on Friday during the conference! The very first, AEA-Europe Special Interest Group (SIG) is ready for launching and the focus is E-Assessment. Managed by a pan-European steering group from research, industry and academia, the E-Assessment SIG provides a forum for the exchange of ideas, knowledge and information relating to educational E-Assessment, by means of a dedicated Facebook Group, meetings of its members at the AEA-Europe annual conference, and through other activities organized by the SIG in response to emerging issues and themes. The Facebook Group provides a focal point for AEA-Europe members who share an interest in E-assessment, and to provide opportunities to work together and develop specialist E-assessment skills, knowledge and professional competences to support best practice. The E-Assessment SIG also acts as an expert resource to AEA-Europe and its members on knowledge, practice and the development of policies and strategies related to E-Assessment. Come and join our first discussion session at the 18th AEA-Europe Conference in Prague: Friday 10th November 2017 at 11am. If you would like to help develop our e-assessment SIG please get in touch in the first instance with its administrator, Lesley Wiseman, at Lesley.wiseman@hotmail.com. In June 2017, at its International Research Conference in Prague, the International Association for the Evaluation of Educational Achievement (IEA) presented a new website: the ILSA Gateway. It offers a centralized access to major international large-scale assessments (ILSAs) in education conducted by the IEA (ICCS, ICILS, PIRLS, TEDS-M, and TIMSS) and other organizations, including CONFEMEN (PASEC), the IDB (PRIDI), the OECD (PIAAC, PISA, and TALIS), UNESCO (TERCE), and the World Bank (STEP). The Gateway does not replicate or replace the individual study websites but serves as an additional, overarching service intended to strengthen the ILSA community by facilitating access to resources, encouraging knowledge exchange, and inspiring future research. For each study, the Gateway provides comprehensive information in a standardized format, organized around the following themes: fact sheets, frameworks, designs, results, data, papers, additional materials, and organization. The text contents on these thematic pages, created in close collaboration with study directors and their teams, are complemented by a comprehensive collection of hyperlinks allowing for quick and easy access to reports, data, and other documents on the external study websites. The paper database provides users with an overview of relevant articles published to the date in peer-reviewed journals around the world, mainly reports on secondary analyses of the above- mentioned study data. The Gateway also features a glossary and a news section with announcements of recent publications, upcoming events, and job opportunities. The ILSA Gateway, developed by the IEA with the generous support of the National Center for Education Statistics (NCES), targets researchers, policymakers and decision makers as its primary audiences, but, as an open source project, can also facilitate work of officials and staff from intergovernmental, international nongovernmental and civil society organizations. The new website will evolve based on the needs and interests of its users and the ILSA community. Visit the new website at www.ilsa-gateway.org for deeper insights into large-scale education studies. For more information about the ILSA Gateway, please contact: Dr Nathalie Mertes (Gateway Production Manager, IEA Hamburg, Germany) at nathalie.mertes@ilsa-gateway.org. The 44th Conference of the International Association for Educational Assessment (IAEA) will take place in Oxford, from the 4th – 14th September, 2018 (with pre-conference workshops occurring on the 9th). The theme for the conference is Assessment & Big Data and it will be hosted by the Oxford University Centre for Educational Assessment. The conference will provide an opportunity for researchers and practitioners to share their understandings of current processes and findings, as well as to look at opportunities for exploiting Big Data.